To create a form in Word that others can fill out, start with a template and add content controls. Content controls include things like check boxes, text boxes, date pickers, and drop-down lists. If you’re familiar with databases, these content controls can even be linked to data. Creating a fillable form begins with six basic steps. Let’s walk through them below. On the File tab, go to Options > Customize Ribbon. Under Customize the Ribbon, in the list under Main Tabs, select the Developer check box, and then click OK.
To save time, start with a form template. To start from scratch, start with a blank template. In the Search online templates box, enter the type of form you want to create and press ENTER. Click the form template that you want to use, and then click Create. On the Developer tab, click Design Mode, and then insert the controls that you want. Note: You can print a form that was created using content controls, but the boxes around the content controls will not print. In a rich text content control, users can format text as bold or italic, and they can type multiple paragraphs. If you want to limit what users add, insert the plain text content control. Click where you want to insert the control. On the Developer tab, click Rich Text Content Control or Plain Text Content Control . To set specific properties on the control, see Step 4: Set or change properties for content controls. A picture control is often used for templates, but you can also add a picture control to a form. On the Developer tab, click Picture Content Control. Use building block controls when you want people to choose a specific block of text. For example, building block controls are helpful if you’re setting up a contract template, and you need to add different boilerplate text depending on the contract’s specific requirements. You can create rich text content controls for each version of the boilerplate text, and then you can use a building block control as the container for the rich text content controls. You can also use a building block control in a form. In a combo box, users can select from a list of choices that you provide or they can type in their own information. In a drop-down list, users can only select from the list of choices. 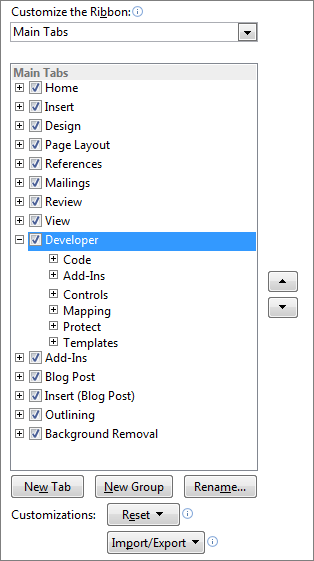 On the Developer tab, click Combo Box Content Control or Drop-Down List Content Control . Select the content control, and then on the Developer tab, click Properties. To create a list of choices, click Add under Drop-Down List Properties. Type a choice in the Display Name box, such as Yes, No, or Maybe. Repeat this step until all of the choices are in the drop-down list. Fill in any other properties that you want. Note: If you select the Contents cannot be edited check box, users won’t be able to click a choice. Click where you want to insert the date picker control. On the Developer tab, click the Date Picker Content Control. Click where you want to insert the check box control. On the Developer tab, click the Check Box Content Control. Each content control has properties that you can set or change. For example, the Date Picker control offers options for the format you want to use to display the date. Click the content control that you want to change. On the Developer tab, click Properties, and change the properties that you want. Instructional text can enhance the usability of the form you create and distribute. You can change the default instructional text in content controls. On the Developer tab, click Design Mode. Click the content control where you want to revise the placeholder instructional text. Edit the placeholder text and format it any way you want. On the Developer tab, click Design Mode to turn off the design feature and save the instructional text. Note: Do not select the Contents cannot be edited check box if you want form users to replace the instructional text with their own text. Open the form that you want to lock or protect. Click Home > Select > Select All, or press CTRL+A. Click Developer > Restrict Editing. Tip: If you want, you can test the form prior to distributing it. Open the form, fill it out as the user would, and then save a copy in a location that you want. If you’re familiar with the desktop version of Word, you might know you can use it to create fillable forms. That option isn’t available in Word Online. 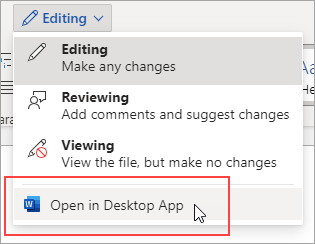 To open your document in the desktop version of Word, click Edit Document > Edit in Word, or click Open in Word. Then follow the instructions in Create a fillable form. 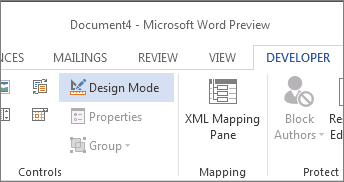 When you save the document and reopen it in Word Online, you’ll see the changes you made.